What mattered a decade ago, still matters today. I stumbled upon a decade old video of me talking about how businesses can better use social media to connect more meaningfully with people. We’re talking 2007 when Myspace was the place to be online. Twitter was the darling of the SXSWi 2007 conference. Facebook had recently extended beyond .edu addresses. People were digging Digg big time. Blogs were becoming mainstream. All this to say that was a long time ago in a galaxy far, far away. But not that far away. The rules I shared ten years ago still ring true today. 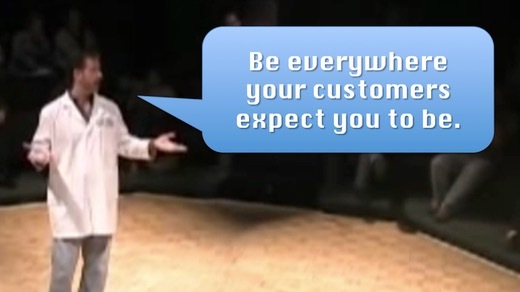 Be everywhere your customers expect you to be. Back then it was if your customers were listening to podcasts, reading blogs, and or using YouTube then your business should be there to connect with current (and future) customers. True today as it was yesterday and as it will be tomorrow. Social media helps small companies look bigger and big companies get smaller. Every business no matter its size has access to the same social media platforms and many of those platforms cost no money to use. This rule is about using social media to engage on a more personal and human level with people. Then it was how a tailor on Savile Row was using video and blogging to look bigger and in the process, this tailor got more clients and was able to charge bigger fees. Today it’s small brands using Snapchat to look bigger and big brands using Instagram stories to get smaller. If you lack confidence, don’t do social media. The real issue here is how vulnerable is a brand willing to be. By sharing your brand’s voice online, you got to be prepared to hear from the haters just as much from people who love you. A decade ago I used the example of Starbucks launching a podcast and quickly canceling it because so many people trashed it. Recently, it was Cinnabon trying (and failing) to get in on the real-time marketing action of using Carrie Fisher’s death to post (and then delete) this unfortunate tweet. If you hide the truth, someone will find the truth. What happens online remains online. Anything posted and shared online is a matter of permanent record. A decade ago, I used the example of an unhappy Dell customer posting a series of “Dell Hell” diatribes to shame the company for delivering horrible customer service. Uber today is reeling from dashboard video of its CEO arguing with an Uber driver over declining fares that hurt his ability to make money. This video will remain online for a very long time.